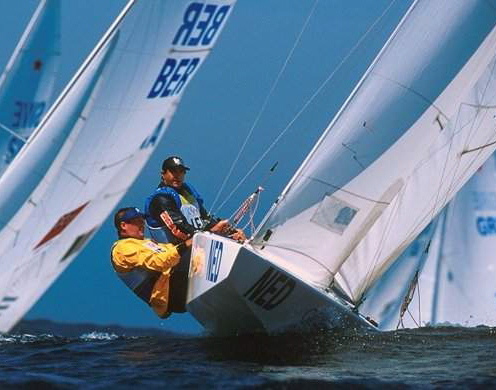 Although the star is a keelboat, it is, to be fast, absolutely essential to make use of the crew weight to keep it as upright as possible. In the beginning (which means probably until 1969 when hiking straps have been legalised), riding a star must have been quite artistic and athletic. Maybe the slow acceptance and adoption of the star in Europe was partially based on the crazy hiking techniques to be seen on the racing courses of that time. The crew was used to sitting in the protected cockpit or in extreme to be placed sitting on deck of a keel yacht. 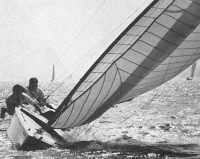 Only dinghy sailors were forced to balance the boat with their own body and weight.. It can be seen easily in the pictures that the hiking stile as great influence on the design of the deck and ergonomics of the cockpit.